As interest rates move higher, dividend stocks are at risk. Here are three classic picks that could fall. The market dodged a bullet yesterday when the Federal Reserve released its interest rate decision. The central bank held the federal funds rate at 0.25%-0.5%, but the decision was close. The committee noted that "the case for an interest rate hike has strengthened, but decided, for the time being, to wait for further evidence of continued progress toward its objectives." Many market watchers are now banking on a December rate hike. Unsurprisingly, stocks surged following the Fed's decision. The S&P 500 went from trading nearly flat at 2 p.m. EDT to closing up 1.1% and is up another 0.7% at the time of writing. It's the best two-day swing for the broad-based index in more than two months. Low interest rates have fueled the stock market's growth by making bonds less appealing so income investors have piled into dividend stocks for the yield. But there are signs that dividend stocks could get hit hard once the Fed does raise rates, which it will do eventually. Earlier this month, when a Fed president argued for a rate hike, the S&P 500 fell 2.5% in a single session, but dividend stocks, especially those in the telecom, utilities, and consumer staples sectors fell harder. Below are three consumer goods stocks that could take a dive once the Fed raises rates. Historically, Coca-Cola has been one of the best stocks on the market, but times have changed. Americans are turning away from sodas due to health concerns, and already sluggish sales growth abroad has been hammered by the stronger dollar. Over the last five years, the beverage giant's revenue and earnings per share are essentially flat without adjusting for currency changes. KO Revenue (Quarterly) data by YCharts. Nonetheless, the stock has steadily climbed as investors have bid it higher, in pursuit of a giant brand with a stable business and a steadily growing dividend, which has reached a yield of 3.3%. Coca-Cola's price-to-earnings ratio climbed as high as 28 earlier this year, its highest point in more than 10 years. As the stock has pulled back, the valuation has fallen, but as bonds become more appealing, investors are likely to move away from Coke. Like Coke, Procter & Gamble is a titan of its industry, and has historically been a great stock to own. Today, however, it is facing many of the same challenges as Coca-Cola. The company has saturated the U.S. market, seeing flat growth at home, and has been challenged abroad by the stronger dollar. It's sold many of its secondary brands as part of a turnaround strategy to focus more on its core brands, which include Tide, Crest, and Gillette, but revenue and earnings have fallen as a result, and the company missed potential acquisition opportunities as rival Unilever has scooped Dollar Shave Club and Seventh Generation in recent months. Still, the stock has gained 40% in the last five years, and its P/E ratio reached over 30 at one point, but is now at 24 as earnings bounced back last quarter. P&G is a trusted dividend payer, a Dividend Aristocrat like Coke, that offers a 3% yield today. 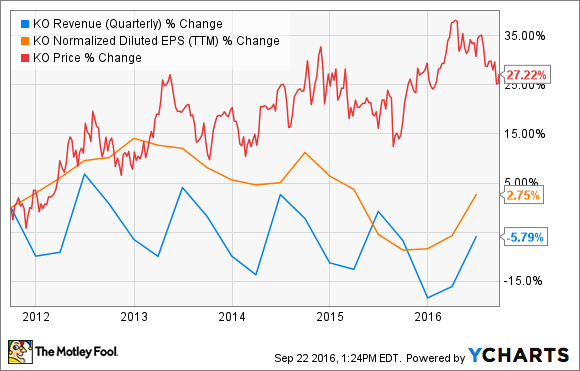 Without core earnings growth, the stock may be in trouble when the Fed raises rates. Legacy foodmaker stocks have also been bid up in recent years for similar reasons as Coke and P&G. The Cheerios maker offers a stable business with a strong dividend, but those companies have struggled to find growth as consumers turn to organic and natural foods. General Mills acquired Annie's in 2014 to help patch that wound, but organic companies have become more expensive, making acquisitions more difficult. As the chart above shows, General Mills earnings have grown faster than the two companies above as it derives the majority of its sales from the U.S., so it hasn't faced the same challenges with the stronger dollar. Still, earnings growth has badly trailed its own stock growth, and revenue fell once again in its earnings report earlier this week. 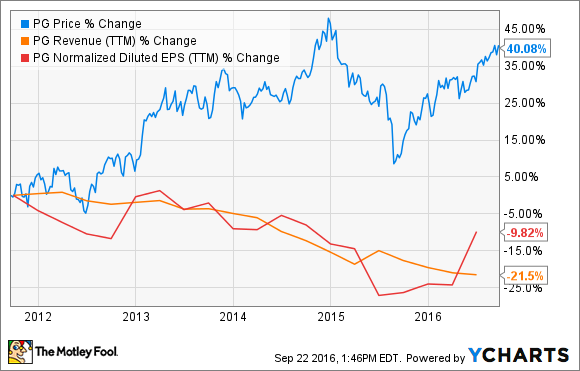 The food giant offers a solid dividend yield at 2.8%, but the stock has already begun to come down this year. Like the others, its P/E ratio topped out around 30, but now sits at 24. 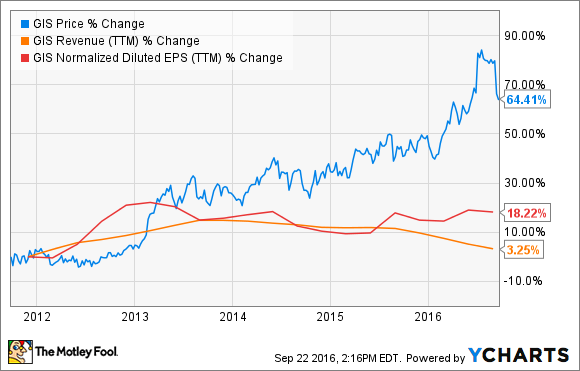 All three of these stocks face secular challenges that are likely to persist for years. They are stable, profit-generating businesses with strong dividends, but as bond yields move higher, investor interest will likely fade.